ColorStix Solid Ink Sticks produce brilliant, vibrant prints on a wide range of media with 90 percent less waste. Drop-in loading of solid ink sticks is as easy as loading a stapler. You will not have to unpack, shake, slide in, pull out and dispose of. No mess solid ink sticks are safe and clean to handle. You will also save storage space because the packages of solid ink sticks are small enough to fit into a desk drawer. 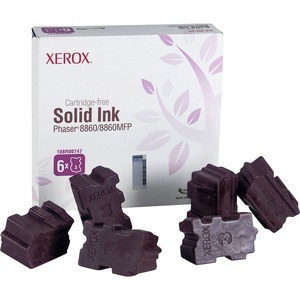 Ink sticks are designed for use with Xerox Phaser 8860MFP and 8860. Each ink stick yields approximately 2,333 pages.